Dale Carnegie stated that smiling helps win friends and influence people. Research on the effects of smiling has backed this up and shown that a smiling person is judged to be more pleasant, attractive, sincere, sociable, and competent than a non-smiling person. There is evidence that smiling can attenuate judgments of possible wrongdoing. 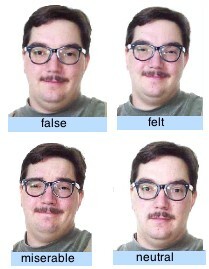 This phenomenon termed the "smile-leniency effect" was the focus of a study by Marianne LaFrance & Marvin Hecht in 1995. Does smiling increase leniency? Are different types of smiles differentially effective? There was a single person used for all the conditions. This may limit the generalizeability of the results. Leniency A measure of how lenient the judgments were. LaFrance, M., & Hecht, M. A. (1995) Why smiles generate leniency. Personality and Social Psychology Bulletin, 21, 207-214. Create parallel boxplots for the four conditions. Find the mean, median, standard deviation, and interquartile range for each group. Create back-back stem and leaf displays for the false smile and neutral conditions (It may be hard to find a computer program to do this for you, so be prepared to do it by hand). Use the Tukey test to compare each mean to each other mean. Compare each mean to the neutral mean using Dunnett's test.